While out walking Raven this afternoon I had another, closer look at the ferns that were mentioned in yesterday’s post, specifically the Marginal Shield Fern, Dryopteris marginalis. When I took the first set of photos, I hadn’t thought to check the underside of the fronds for the spore pores, so I did that today. One of the references I used for the last post was A Field Guide to the Familiar by Gale Lawrence. In it she indicates that an easy way to tell the three species apart is by the patterns of the spore cases on the underside of the subleaflets. The pattern of these dots – actually called sori (singular sorus) but also commonly referred to as fruitdots, which I find inexplicably amusing – is unique to each species (at least each of these three). As I stated yesterday, those of the Marginal Shield Fern are lined up along the margins of the subleaflet, giving the fern both its common and scientific names. You can see that in the photo above. The fruitdots are empty now, the ferns having cast out their spores to the wind in late fall, but the cases remain affixed to the evergreen fronds. 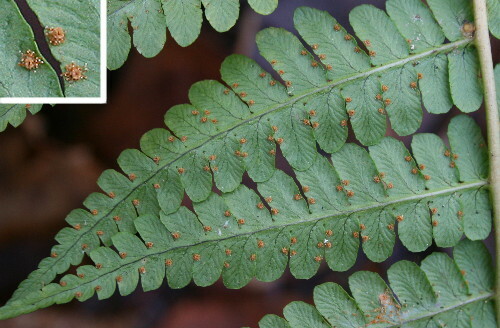 Not all species of fern have fruitdots, some curl over the edges of the subleaflets or other means of protecting the spore cases. “Fruitdots?” I have never heard that, but like it too! Very nice photo with zoom in on the side. Well done. The spore containers do look unusual, skittered over to the edges like that. Maybe because they sound like the candy Jelly Tots, but “fruitdots” makes me think “gummy ferns” .